With seating for 250, Hockett is the ideal hall for chamber music, faculty recitals, and the graduate and junior recitals. 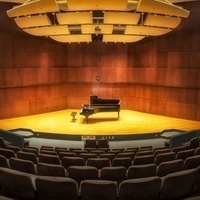 Located in the James J. Whalen Center for Music. I loved it, Ms.Martha is amazing for having performed so beautifully aside from the fact that she was ill. The recital warmed my heart on such a cold night. I really enjoyed how Elizabeth explained various parts of her performance. I felt like she made us apart of her performance and it was very beautiful. When she performed Bach, I enjoyed how she used music and explained that it Bach had wanted some things to be uneven musically. Great connection with fellow musicians and audience members! The event was canceled, but I did not receive notification. Lesson learned to check the website before driving back up to campus for events. Lucky to see this live! One of the over 50 original paintings by artist Michele Tremaine that will be projected in synchronization with Mussorgsky's "Pictures at an Exhibition".